The Lodi apple tree produces juicy, yellow apples. It is called the early bird of the orchard as it gets ready for harvesting towards July, one month prior to the peak apple harvesting season. As usual the tree requires more sunlight during the fruit’s maturity, which is favored by the summer before July. 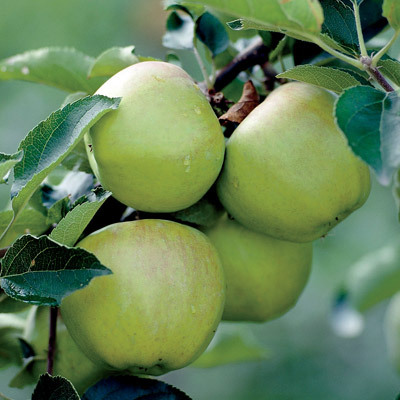 The Lodi apple tree spreads over an area of 10 to 25 feet and grows as tall as 15 to 20 feet at full maturity. The plant shows a medium growth rate when its size is concerned, but the stage of growth doesn’t affect the fruiting abilities of the tree. It grows in moist soils. The site of plantation is equipped with well drainage system to avoid extra water content in the soil. A standard Lodi apple tree requires 800 – 1000 chill hours. The tree needs minimum six to eight hours of sunlight exposure. It is not drought tolerant. The apple trees can be destroyed by rodents and rabbits. intensive care should be given to the area of gardening and rodent holes should be destroyed. They usually girdle the stem or trunk. The plant produces nectar and pollen which gives the nutritional platform to the bees. Standard Lodi seedlings are grown into one root stock. Then the semi dwarf seedlings are grafted onto Malling-Merton III. The flower is either white or pink. It is pollinated with higher breeds. The fruit is somewhat yellowish green and of any average apple’s size. It comes with a sweet tart flavour, has white pulp. As they are harvested in summer, they can be preserved for few weeks. Once they are taken out of the freezer, they need to be consumed as soon as possible. The most common use of Lodi apple is making sauces and pies. A standard Lodi Apple tree starts fruiting in 6 – 10 years. The semi-dwarf variety grows fruits in 4-6 years and the dwarf in 3-4 years.